As Jay Leno’s tenure as host of NBC’s “The Tonight Show” is nearing an end, a study released Tuesday by George Mason University’s Center for Media and Public Affairs find former President Bill Clinton was Leno’s favorite joke target during his 22 years on the show. The authors of that study had the arduous task of going through 43,892 jokes told by Leno on his show from May 25, 1992 through Jan. 24, 2014. Clinton was elected six months after Leno’s start on “The Tonight Show” and had suffered through his Lewinsky scandal in his second term while Leno was hosting. 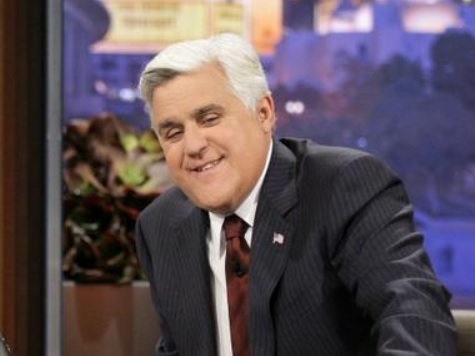 According to the study, Leno delivered 4,607 jokes, accounting for more than one out of every 10 of Leno’s jokes about public affairs and public figures. As the Los Angeles Times pointed out, Clinton had never been a guest on Leno’s program despite having appeared on his rival’s program, CBS’s “The Late Show with David Letterman,” 10 times during the same time period. Behind Clinton was former President George W. Bush, having also been in office for eight years while Leno was hosting, with 3,239 jokes told by the late-night comedian aimed at him. The study also found that Democratic targets slightly outnumbered Republican targets in the study by a 10,885-to-9,465 margin, which, according to the study, was a result of Democrats occupying the White House in 13 of Leno’s 22 years as the “Tonight Show” host. As far as non-political figures, Leno’s favorite target was O.J. Simpson, according to the George Mason study, having had 795 jokes tallied over the 22-year span. Deceased pop singer Michael Jackson was second with 505 jokes aimed at him.